To find a retailer near you, click here. If you would like to carry these snowman figures in your shop, contact us for order and price information. A Sachsen Imports exclusive! Handmade in Germany! Snowman figures are popular not only during Christmas, but all winter long. While snowman figures are easy to find, we think we have found the most unique snowman figures of all, and all are exclusive to Sachsen Imports. Click on each image for a larger view and more information. Fritz and Otto were born in the German village of Grünhainichen. Full of whimsy and charm, each snowman figure has a small silver-colored metal heart stamp on his left foot. Click on each image for a larger view and more information. 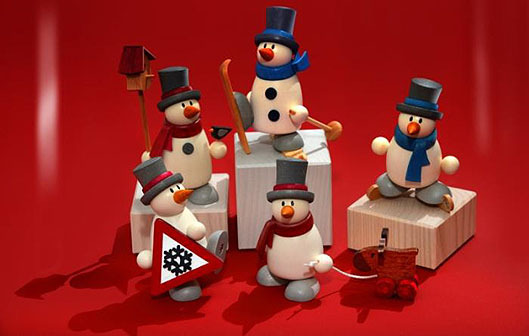 More snowman figures from Karsten Braune can be found here.